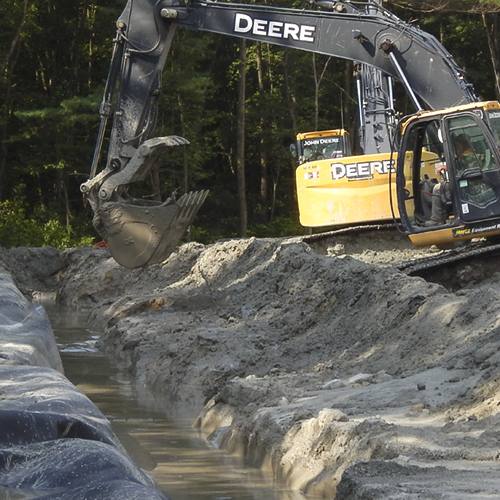 Explore the applications and advantages of using Soil-Bentonite Groundwater Barriers. Soil-Bentonite (SB) slurry walls are the most common type of slurry wall. These walls were sporadically used in the United States between the 1940’s and 1970’s after which their use became commonplace. Thousands of these walls have been constructed in a number of purposes. For this type of wall, the permanent backfill is a blend of soil and bentonite clay that is placed in a high slump condition. 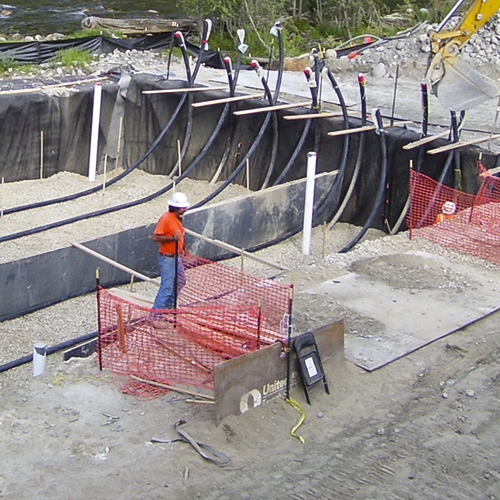 The high slump backfill is placed through the slurry to serve as the final barrier wall. 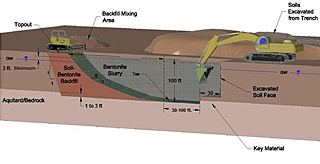 In the US, the SB slurry wall technique is used far more frequently than any of the other slurry trench construction methods (cement-bentonite or soil-cement-bentonite). 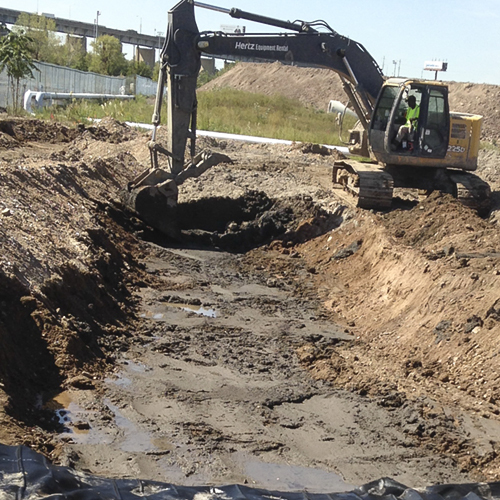 The SB slurry wall is typically excavated with a long reach excavator under a bentonite water slurry. 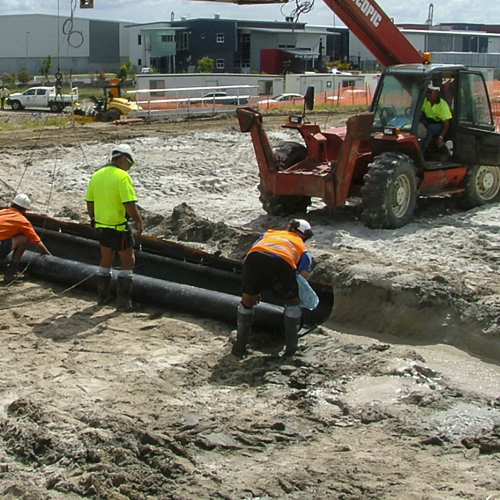 The slurry stabilizes the excavation without the need for conventional shoring. 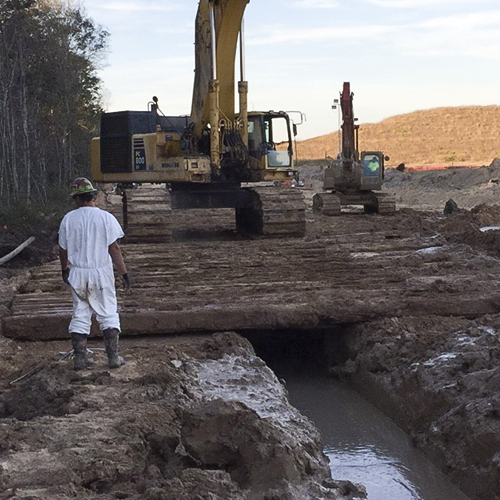 This allows the excavation to proceed to almost any depth, even well below the water table. 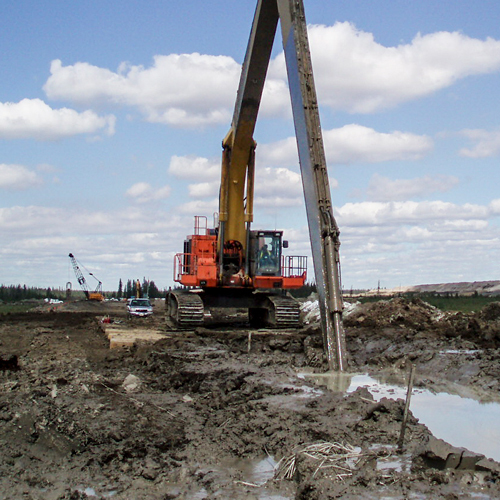 Long reach excavators designed for slurry trenching are capable of digging down to depths of around 90 ft (26 m). Clamshell excavators may be used to go even deeper. 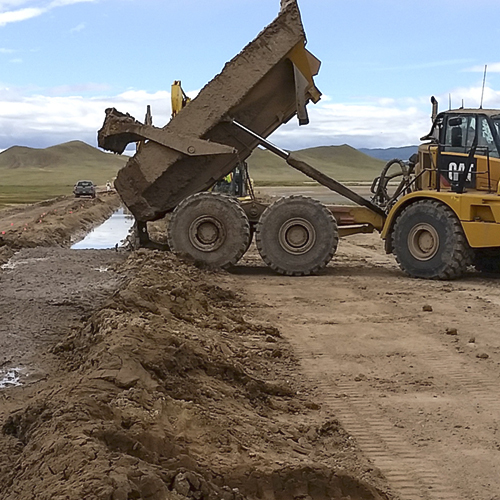 Once the trench is completely excavated, a blend of soil excavated from the trench, dry bentonite, borrow soils, bentonite slurry and any other necessary additives are mixed at the surface and placed into the trench by a bulldozer or second excavator. The mixture is placed in a semi-fluid state which allows it to flow into the trench and displace the trench slurry. 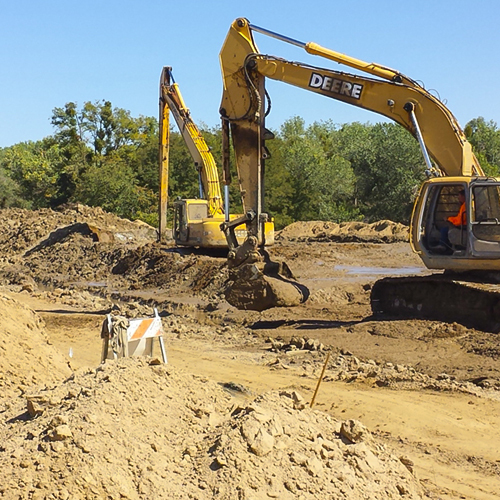 When the backfill operation is complete, the SB backfill consolidates slightly and behaves like a soft clayey soil. A schematic of the process is shown below. 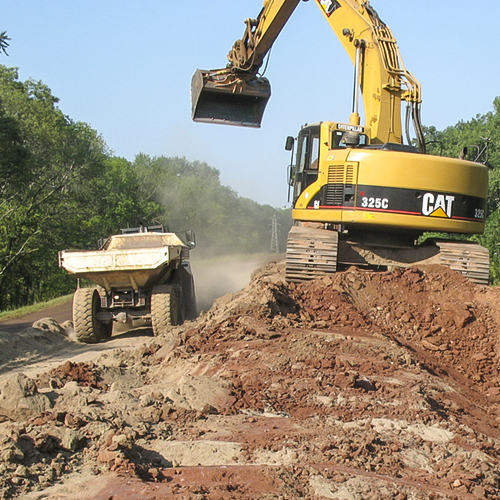 SB backfill may be blended using a variety of equipment. 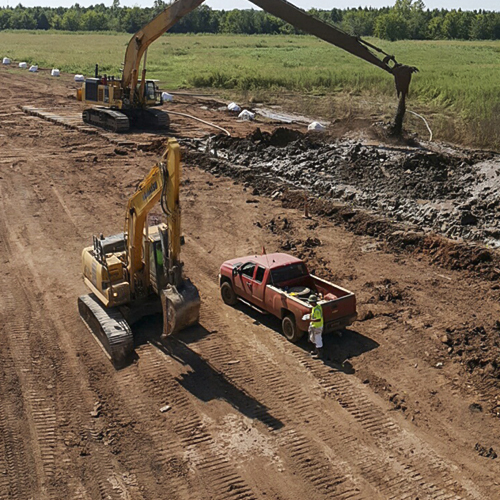 The most common and convenient method is to mix batches of backfill alongside the slurry trench using small excavators and/or bulldozers. The resultant mix should look like wet concrete (i.e. low to moderate slump) and is placed into the trench with an excavator. The most important property of SB backfill is a low permeability. Typically SB backfill has a permeability in the range of 10-6 to 10-8 cm/sec. 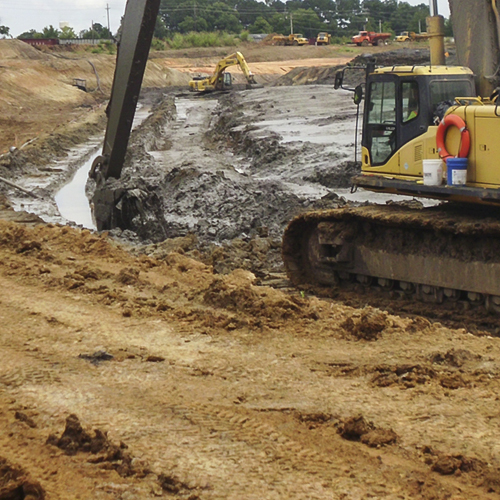 Environmental projects often require a permeability less than 1 x 10-7 cm/sec, but a levee or dewatering project may require a permeability less than 1 x 10-6 cm/sec. Either value is achievable with the right mix of materials. SB backfill has low strength and will remain soft (in the range of 300 psf (15 kPa)) for the design life, but this is nearly always sufficient to maintain a vertical cut through the wall for subsequent installation of utilities and other light structures. Larger surface loadings like roads and structural foundations require the removal and replacement of the top few feet of the wall. 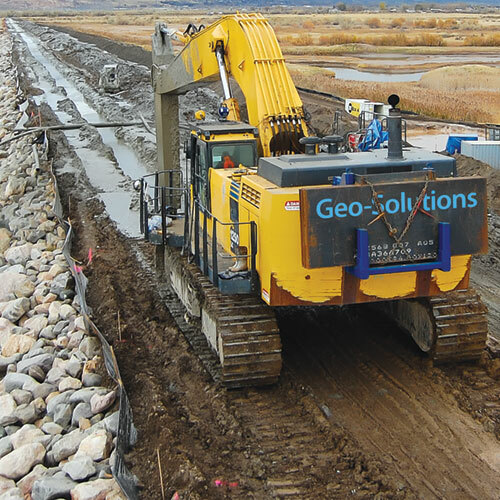 Sometimes geogrids are used to distribute the loads above the wall to soils adjacent the wall. 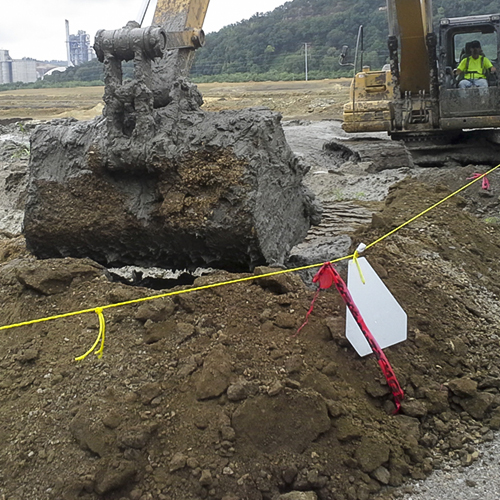 In general, Soil-Bentonite backfill performs well when exposed to pure phase contaminants or impacted groundwater. This is due to the fact that most of the matrix is composed of inert and solid materials. The most important variables in a SB mix design are bentonite content and grainsize distribution. 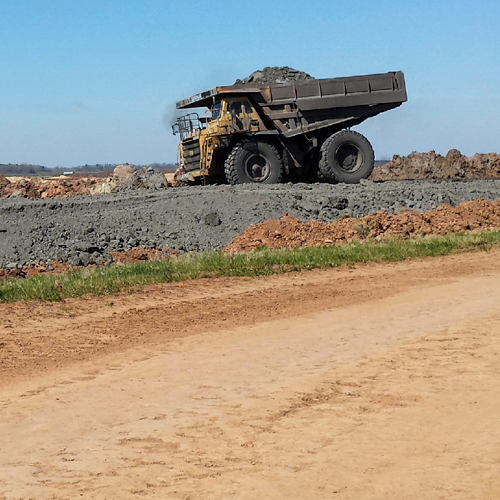 Design mix studies are frequently used to determine if the site contamination will affect the permeability enough to justify increased bentonite content or other mix modifications.